If you have to find some specific content on the internet that is completely relevant to the business line you promote, you might not feel amused at all. The amount of time that you have to devote to the task simply does not justify its worth. You have to sift through tons of information manually, strain your eyes until it starts watering and has loads of patience to go through every content meticulously to evaluate its merit and suitability. Then you have the onerous task of listing and reviewing. To hunt for content manually on the web seems to be the most thankless job in the world that nobody would like to do. However, to keep pace with the demand for content used for online marketing, there is no way that you can afford to avoid the task of hunting for content on the web more aggressively. The demand for content is spiralling every day, and it is a very challenging job to maintain a healthy pipeline of quality content by depending on indigenously produced content. You need the right resources to create original content of high quality, and it takes time and quite some investment to create the desired infrastructure. Maintaining a steady flow of indigenously produced content is not always possible. This creates a gap in demand and supply that you can bridge by taking recourse to content curating. Content curation is the process of finding content relevant to your audience from the sources available on the internet and distributing it through your channels of communication in a strategic manner. The job is far from easy as you face the uphill task of cutting through the maze of information overload. The purpose of curating content is to derive its benefits in marketing so that it adds more muscles to your marketing initiatives. The job can be tricky because the content must have the capability of arousing the interest of the audience who must find enough reasons of visiting your website. Add a personal touch – Content curation is not just about gathering links and sprinkling it around. The content must not only be relevant to the audience, but they must find reasons to be attracted to it. You must add a personal touch to the content thereby using the content as a plank for creating closeness with the audience. Builds value – The content that you curate must make the audience feel as if you have just made it for them and it is what they had been waiting for. The information you share is so precise and timely that they are overjoyed at your benevolence and you make advances in building relationships. Replaces promotional content – The purpose of content curation is to go beyond the traditional approach of promoting products and stay connected with the audience with content that adds value and provides wholesome experience to them without speaking about products and features. With several content curation tools available, the task has become much easier and enjoyable. 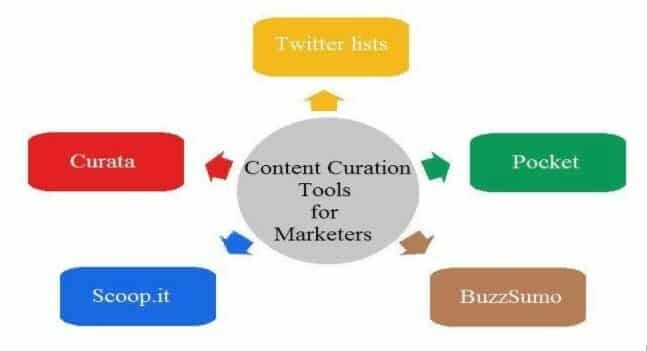 Some of these tools have found a place in this article, which you can consider as a guide on top content curator tools. Twitter is a favourite hunting ground for curators but what you get from it depends on how well you manage the accounts you follow. Twitter Lists is a handy tool that allows you to categorize Twitter users you are interested in so that you can follow them separately from the crowd of other users. To make the results more meaningful, you can create an account with another tool named Pocket where you can deposit the Twitter articles you gather. This tool creates a repository for contents you gather during the process of curation so that you can make use of it later. All articles, images, and videos are nicely organized, and you can tag the articles that make it easy to retrieve by using the search feature provided with the tool. The tool is capable of integrating with as many as 500 other apps. You come to know about the articles most saved on the platform from the tweets that the tool sends to all users. The BuzzSumo is a great tool that provides a list of the most shareable content while providing information about its sharing level. To get a list of your desired content, type the domain name or keyword, and you see the list of content around the topic along with the sharing figures. There are sorting options by content type (images, videos, guest posts, etc. ), date, author, etc. Since you have the idea about how much popular the articles are, the task of choosing becomes easy. Scoop.it is a content curation tool that is a blend of social media and content curation, and its user interface will remind you of Pinterest. The tool is like your guide in content curation because when you feed it with your topic of interest, it does much more than providing a list of relevant content for viewing and sharing. It will also come up with suggestions about other complementary topics and even provide a list of other Scoop.It users worth following. You receive daily updates on articles of your interest, so that enables you to stay tuned with times. You can post one topic on two platforms of social media if you use the free version. The paid version has much wider options across multiple social media channels. Curata is the tool that is capable of assisting users to discover audience specific content without having to put in any labour. There is one central platform from where users can perform all the activities. You can do the fine-tuning including customization and categorization of content sources, review it and then distribute it in the way they want. The feature of promoting and publishing allows you to re-purpose old content across any media and marketing platforms. Since different tools have different capabilities, discern the role that content curation plays in your marketing operations before you decide on the type of tool that you need. Derek Iwasiuk is an online marketing expert who heads the SEO firm that he has founded. At one time, he was one of the top expert shooters of the country and had spent six years as an air cadet. To know more about his achievements and capabilities log on to http://www.derekiwasiuk.com/. How Do You Set Up A Google Business Page Properly? How Do You Set Up A Google Business Page Properly? You need to follow these simple steps to get it right. How to sell more online – use the phone…! As always, great article Derek. Your knowledge of SEO is some of the best out there, and I like the fact you are always willing to share it.